Brief Description of Subject: The "Gift" is the title given by this Church for this 6 paneled window located in the Perpetual Chapel. 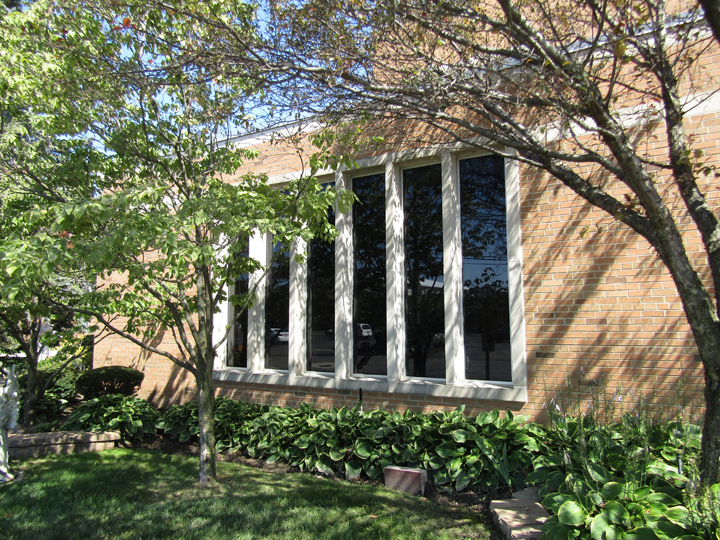 It is my understanding that the idea for the window came from the Pastor at that time, Monsignor Kucyk. 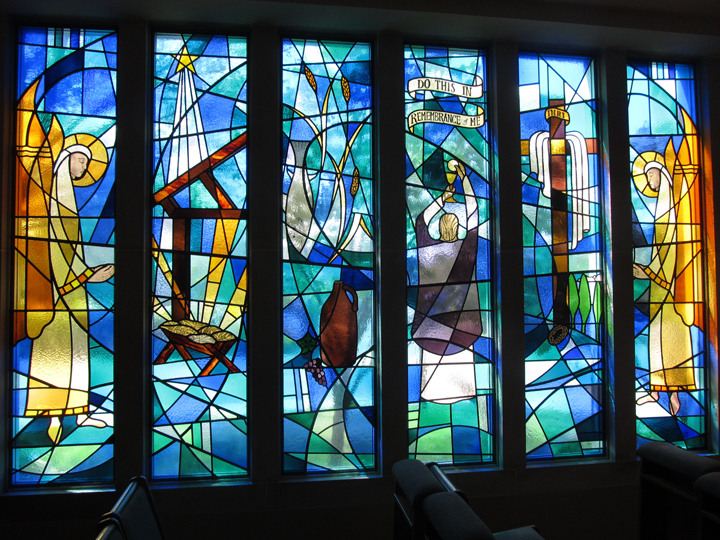 The artist, Kirk Thompson III, then worked with him and later his assistant on the design of this window. The window can be looked at either as four gifts from God or, since all of the gifts can be connected to the Eucharist, just one gift. The first and sixth panel depict Angels presenting the gifts from God. The second panel represents the gift of God, the Father, sending his only Son, Jesus, to us. Seen is the Nativity scene, a stable, a manger and a five pointed star. The third panel is the gift from Jesus of the Eucharist -- his flesh and blood. Seen is wheat, grapes, a wine jug and a fish. The word "fish" in Greek is ICHTHYS which is an acrostic for "Jesus Christ, Son of God, Savior". At the Last supper Jesus will turn bread and wine into his flesh and blood -- the Eucharist. 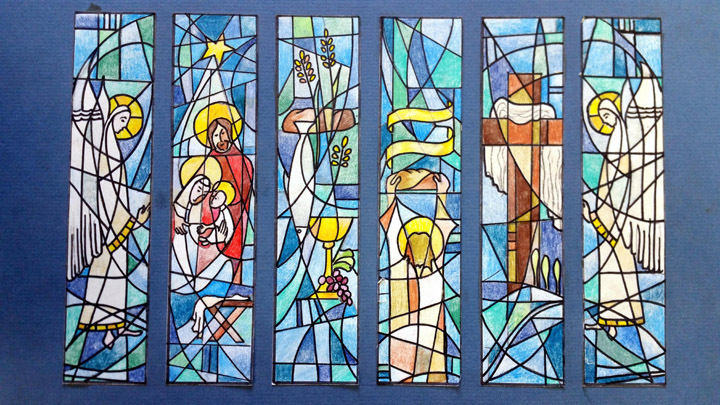 The fourth panel is the gift from Jesus that designates priests as his representatives on Earth with the power of changing bread and wine into the body and blood of Christ. The inscribed words in this panel "Do this is remembrance of Me", is what Christ's representative on Earth, the priest, will say as he transubstantiates the bread and wine into the flesh and blood of Christ. The fifth panel is the gift of eternal life from the Eucharist. John 6:51-58 Jesus said to them, "Very truly I tell you, unless you eat the flesh of the Son of Man and drink his blood, you have no life in you. Whoever eats my flesh and drinks my blood has eternal life, and I will raise them up at the last day. For my flesh is real food and my blood is real drink. Whoever eats my flesh and drinks my blood remains in me, and I in them." Pictured in this panel is a cross, with the inscription INRI, and a white shroud draped over it. This is a symbol of Christ's victory over death and the promise of eternal life --- in the Catholic Church, a black shroud (death) is draped over the cross on Good Friday, and on Easter Sunday it is replaced with a white shroud (resurrection) which will remain there until the Ascension.